not have a pleasure with this par force hunt, as they exercise, and hold, such between Ballenstett, Hartzgerode, Güntersberg, and Gernrode in the very high mountains; after all in that region there are ever and anon mountains which are hardly passed, that frequently one has to lead the horses down, not to say one should hunt there along in gallop. “ Yet the hunt goes well, albeit one has to depend a lot on the hounds. There are nothing but German hunters, and many a Frenchman would be astonished should he participate in this cumbersome hunt. 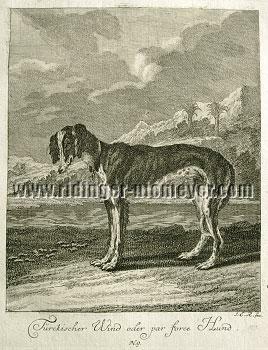 (Döbel, Von der Parforce=Jagd, within Jäger=Practica, 3rd ed., 1783, pt. II, pp. 87-108 ). Ridinger, Johann Elias (Ulm 1698 – Augsburg 1767). 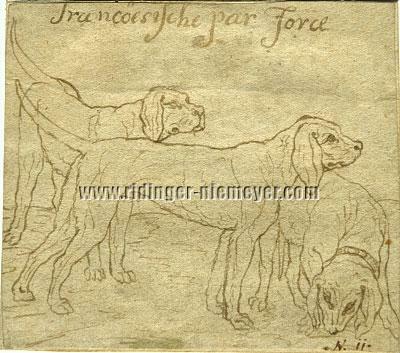 English par force and German Hounds. Etching w. engraving. (1738.) Inscribed: J. E. R. f. / N. 5., otherwise in German as above. 7⅜ × 6 in (18.8 × 15.2 cm). Thienemann & Schwarz 395. – Sheet 5 of the instructive set Design of Several Animals in its first edition with its strong laid paper. – “These plates are much wanted and frequently copied” (Th. 1856). – Margins above & below 6-6.8 cm, laterally 1.8-2.3 cm wide. – At the upper edge still both the two original fine pricks. – – –Turkish grey or par force Hound. As above. – Thienemann & Schwarz 399. – Sheet 9 of the set. – – – French par Force Hounds. As above. – Thienemann & Schwarz (ill. vol. I, page 57) 396. – Sheet 6 of the set. – – – French par Force (Hounds). Only three of them yet. Pen and brown ink. C. 1735. Inscribed in bistre: in the upper margin Francöesische par Force & lower right .N.11. (sic!). 3⅝ × 4 in (92 × 103 mm). 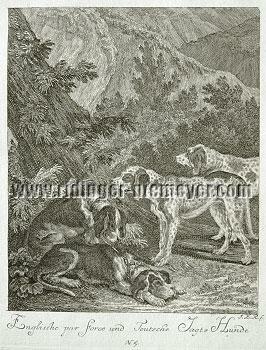 Still deviating from the engraving , outline design in the same direction and original size of three of the hounds to Thienemann 396 & Schwarz (ill. vol. I, page 57) as no. 6 of the set, by Ridinger here still intended as .N. 11. Still missing the fourth hound extending into the subject with just about a third, yet up to above of the lying third one. Also the not present Hounds in the designation with consideration of spacing, but also the numbering rather far right, quite obviously original. – For the preparatory drawing of the entire composition in wash and bistre see Th. ibid. para. 1 and lot 552 of the Ridinger appendix of Weigel’s catalog of drawings of 1869 resp. which he dates as of 1735. Present work a therefore rare, indeed, precious evidence. From an old album with corresponding traces of mount on the back and erroneous written attribution to Jos. Gg. Wintter in pencil. – Cut of the upper arch of the first F of the designation, the stroke of which in harmony with that of the engraving. – – – Par force Hunter with the pack. Postcard in rotogravure after Thienemann 115 by O. Felsing, court copperplate printing office, Charlottenburg (Berlin). Same place, Nationaler Verlag Wilhelm Felsing, c. 1900-1918. 5⅜ × 3⅝ in (13.8 × 9.2 cm). 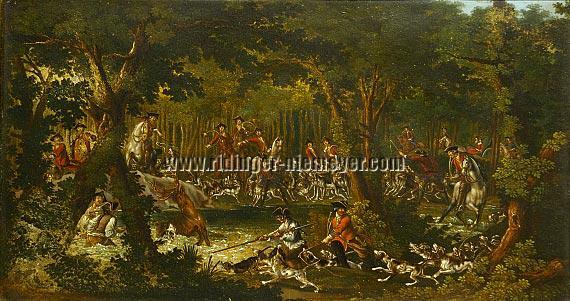 – Unused “ARTIST POSTCARD” after the sujet of the Falconers set etched by Martin Elias R. – “He rides an English horse and blows the bugle. The pack accompanies him solemnly and quietly”. Vernet, Carle (actually Antoine Charles Horace V., Bordeaux 1758 – Paris 1836). 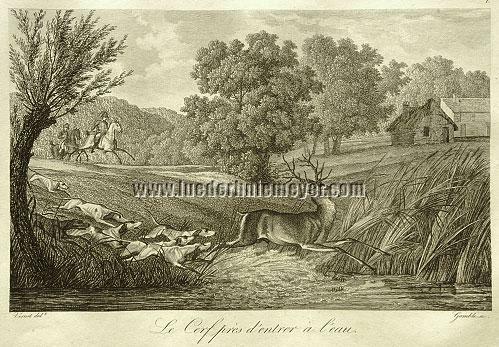 (La chasse à Courre [au cerf].) Suite of 24 sheet. 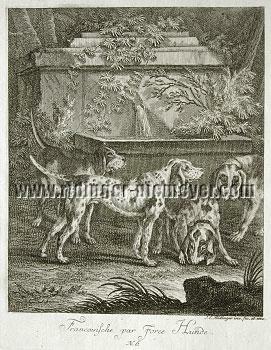 Engravings with etching (8⅜-9 × 11⅞-12⅛ in [21.2-22.8 × 30.2-30.9 cm]) by (Schwerdt: F.) Gamble. C. 1804-1814. Contemp. h. leather with gilt back and brown marbled covers. Dayot 16; Thiébaud 927 (not knowing the first states with Schwerdt & Jeanson and here resp., see below); Schwerdt III, 65: “Highly interesting set” (before numbering); Jeanson, 1987, 574 (before numbering, besides erroneously taking over Thiébaud’s “about 1830” for his later edition). – Not in Souhart and the Schoeller collection. here in the final state as recorded by Dayot as the one and only with both the address (Jeanson and supposedly Schwerdt, too) “Deposé à la Bibliothèque Impériale” and the numbering above right. Thiébaud knows the set only as later, likewise numbered edition with the address “Paris, Veuve Turgis” and dates it in such a way too late at “about 1830”. The classic interpretation of a new century as response to the baroque plenty of the predominant Ridinger as, most interestingly, a favorite especially also with the French aristocracy before the revolution. But now Vernet. First highly paid master of the nobility, then with the red Phrygian cap, but imperturbable in the depiction of what is the fine gentlemen’s savoir vivre. Vernet the Middle, son and at the same time father of famous colleagues. comes along lies in the course of the artist’s nature. Vernet was infatuated with horses. This all then the stations of this set, bound here contrary to the incomprehensible numbering of the plates (this indeed correctly limited to 1-24, yet, e. g., the introducing tracker scenes numbered 21 and 16 resp., Mort & Curée even 4 & 5) in the natural sequence as seen per pencil by the previous owner, deviating only partially from the likewise contemporarily bound Schwerdt copy, for the stag’s final phase evidently faulty though. On the stag turning to bay (no. 2) the “Impériale” effaced as a hint for an impression from after the end of the Napoleonic empire indeed, but still before the address à la Thiébaud, also slightly less wide margins, albeit on lighter laid paper, and of very fine impression, even still with plate dirt. Contrary hereto the other sheets printed on a particularly heavy paper without line watermark with margins of about 3-4 top and below and 5.5 cm laterally resp. Plates 8 & 3 (4 & 23 of the binding) with watermark fragment “8”. not least defined by the fine handling of light and shadow . France’s final bow to “her” finest hunt . Ridinger, Johann Elias (Ulm 1698 – Augsburg 1767). Departure for Hunting. Etching, partly with drypoint, by Johann Daniel Hertz I (1693 Augsburg 1754) for Jeremias Wolff just there. (1723.) Inscribed (torso): Joh. Elias Ridinger. Sheet size 13 × 19 in (33 × 48.4 cm). Thienemann & Schwarz (vol. I, plate III as first state) 9; Weigel, Art Stock Catalog, part XIII (1843), 12586 (as discharge print, presumably identical with that at Faber-Castell/Hamminger, see below); Coppenrath, part II, 1449 (trimmed to the edge of the subject and with “with small margin added”, “extremely rare”, 1889); Helbing XXXIV (Arbeiten von J. E. und M. E. Ridinger, 1554 items; 1900), 8 (“trimmed to platemark”); Counts Faber-Castell (1958) 18 (as discharge print from the Hamminger collection , presumably identical with Weigel’s copy above). and dedicated in this only to Lothar Franz von Schönborn (1655-1729), elector of Mayence and prince-bishop of Bamberg, here, however, as a result of trimming under loss of his dedication, too, see below. The report scenery was used about 1735 by Johann George Heintze as part décor for the rear view of Johann Joachim Kaendler’s Meissen Vase with Lid and Woman’s Head Handles in Dresden (inv. no. P.E. 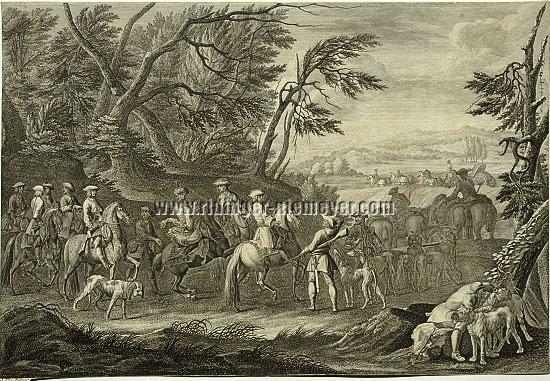 3508), with the second piqueur along with two hounds placed left of the white horse, “silhouetted before the white background … on a painted gold pedestal with central leaf mask and foliage tendrils”. 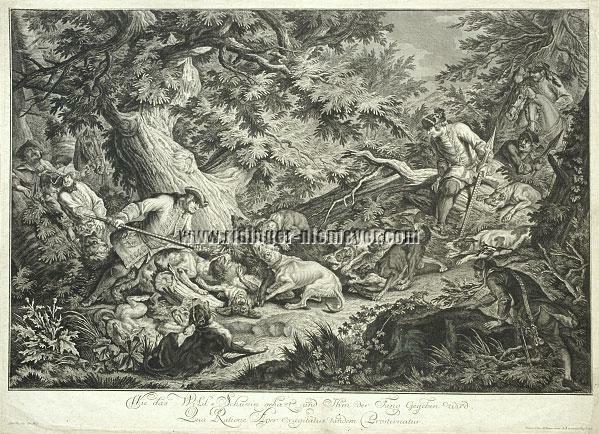 For the cartouche of the front view the Boar Hunt (Th. 12) of the set was used, while the Deer Hunt Th. 10 graces the pendant vase P.E. 7276. See Pietsch (ed. ), Porcelain Parforce, Munich 2005, nos. 59 f. along with three (color) illustrations each of the porcelains and the three Ridingers. Complete copies of the set beside the one known to Thienemann, the one of Baron Gutmann (Schwarz), and after all two traded here provable here only with Schwerdt (III , 134 as in succession of Thienemann and Schwarz not recognized 3rd state with Hertel’s address and in such a way described erroneously as proofs before the Schönborn dedication, subsequently then at L’Art Ancien, Ridinger list 14 , 2, now as “State apparently not described” and putting up for discussion Schwerdt’s “before” the dedication) and the one sold in 1958 by K. & F. (LXIV, 167) as likewise 3rd state and in such a manner possibly anew the Schwerdt copy. as illustrated by Schwarz, yet with regard to trimming to the edge of the subject – only above almost throughout with fine platemark – only with the spared signature rest “Ioh. Elias Ridinger” directly on the left beneath the picture and without the said Schönborn dedication and the Virgil verse thusly only quoted above. Some small tears as well as a thin upper corner backed acid-freely. – Watermark Large Fleur-de-lis. – – – Ducitur ducit(ur)que vicissim – He guides and is guided in turn. Search hunter (tracker) with leader at long leash, stepping out of the woods into the open. In the reset middle distance before tree scenery stopping royal. On the horizon high steeple. Etching with engraving. (1740.) Inscribed: Ducitur ducitqe vicissim. / I. E. Ridinger inv. del. et sc. A. V. 6 × 9⅛ in (15.3 × 23.3 cm; sheet size 17⅞ × 12⅜ in). Thienemann & Schwarz (vol. I, plate X) 162. – Small tear of ⅝ × ⅛ in (1.5 × 0.2 cm) in the left outer margin 4.5 cm wide and faint margin patina, only the lower right corner a bit more from turning over. to the 23-sheet set REPRESENTATION OF THE FAIR GAME with their tracks and traces added … — ask for two complete copies available here, one of which as Ridinger’s personal copy — together with the fullpage PRILIMINARY REPORT in its fine large typography (in German) on the back. The extensive title text itself in red & black and in deviating state raising chronological question, as known here so far only of the title sheet of Ridinger’s aforesaid personal copy. Johann Elias Ridinger (Ulm 1698 – Augsburg 1767) & Georg Adam Eger (? 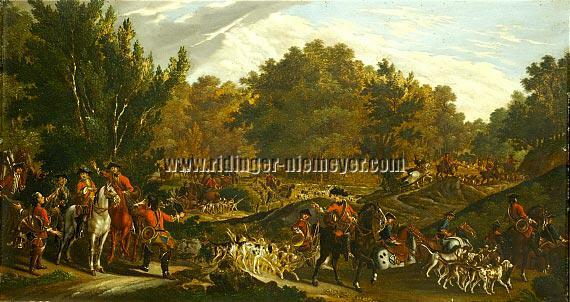 1727 Murrhardt 1808; till 1768 court hunt painter at Darmstadt). 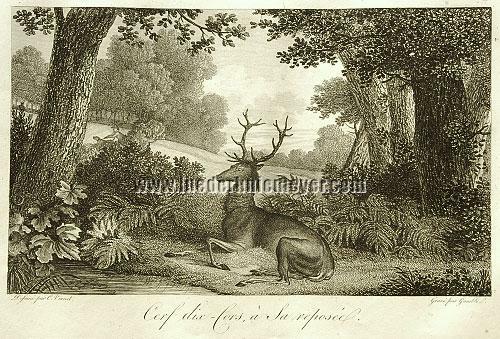 Two etchings from Ridinger’s Par Force Jagd of the Stag in their plain image size printed on grounded zinc, executed as oil paintings in the colors of Hesse-Darmstadt by Eger or his circle, probably partially with use of tempera. Supposedly 1764/68. 10¼ × 18⅝ in (26.2 × 47.2 cm). Green-gold-foil frame. Kölsch, Gg. Adam Eger … Jagdmaler am Hessen-Darmstädter Hof. Catalog of the Works in the Museum Hunting Seat Kranichstein, 2010; Thieme-Becker, Eger, X (1914), 369; Siebert, Kranichstein, Jagdschloß der Landgrafen von Hessen-Darmstadt, 1969; Hofmann, Führer durch das Darmstädter Jagdmuseum Schloß Kranichstein, 1981; Michel, Vorfahren und Verwandte des Tiermalers und Kupferstechers Joh. Elias Ridinger in Blätter des Bayer. Landesvereins für Familienkunde, vol. XV, 1987, 396-414. (Gisela Siebert). – See the comprehensive documentation. Emil Seitz’ (presumably Unterweissach near Backnang c. 1830 – New York 1911) address. Ridinger, Johann Elias (Ulm 1698 – Augsburg 1767). 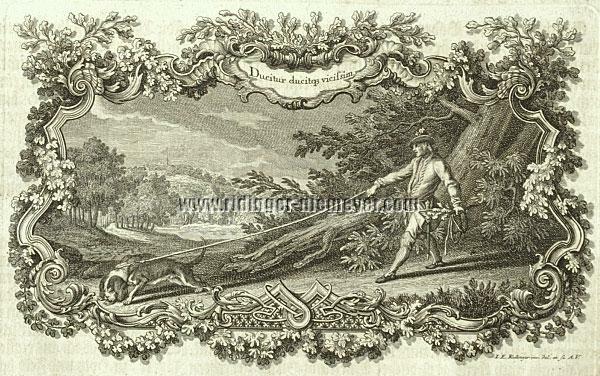 How the Wild Boar is hunted and dealt the coup de grâce – Qua Ratione Aper Exagitatus tandem Prosternatur. 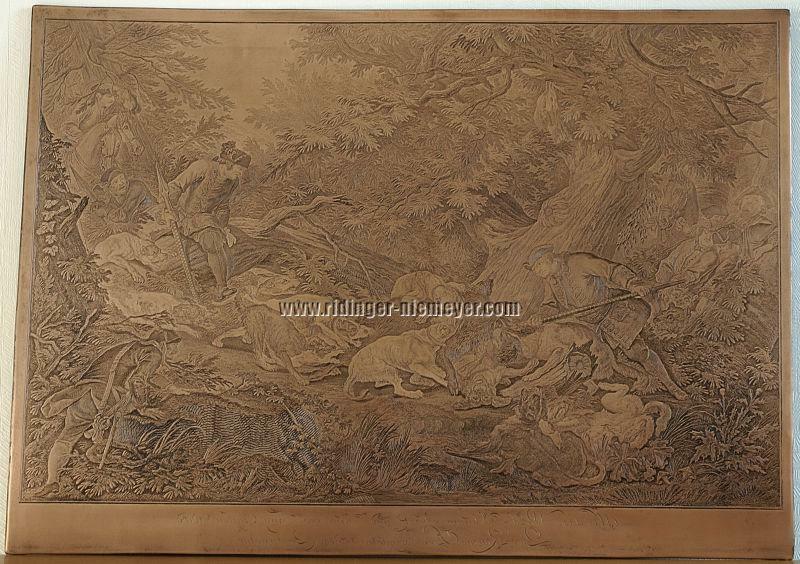 Copper-printing-plate in reverse. Inscribed: Johann Elias Ridinger inven. fecit et excud. Aug. Vind., otherwise in German-Latin text as above. 21¼ × 29¾ in (54.1 × 75.6 cm). (Stefan Morét in Ridinger catalog Darmstadt, 1999, pp. 62 f. See also the plates there I.13, I.8 & I.11, colour ills. 6 & b/w ills. pp. 63 f.). shall be mentioned expressly. Just as documented by above inscription, too. “ New York Emil Seitz Broadway No. 413 ” ! Seitz was the son-in-law of the Augsburg publisher Ferdinand Ebner I (1786-1859, children Ferdinand II & daughter Emma), together with brother Ludwig (by marriage about 1809) owner (by partnership in 1821) of the Herzberg Academic Art Gallery there which about 1824/25 had taken part both for technical support and as publisher in the new Ridinger editions by the Engelbrecht Gallery there. Some years before the latter had taken over the Ridinger Publishing House including the printing plates. Independently of this Ferdinand established his own publishing house in 1823 which was sold after his decease in 1860 and went bankrupt insolvent under the successor Bauer in 1864. In the absence of a successor the Herzberg store was liquidated still by Ludwig himself about 1852. Before his union with Emma Ebner Seitz had worked together with her brother Ferdinand (II) in Berlin. The wedding took place in New York in 1852, where Emil Seitz had moved late in 1850. With Broadway address from the beginning. Only in the foremost time no. 233, then 413 for good! is in such a way excellently dovetailed with Ridinger’s estate of plates . By that time Seitz had finally retired from business already 25 years before! It was an American career ! In a Big Way — Emil Seitz & Ridinger on Broadway. The attribute as “the largest plates” by the way has to be amended to the effect that several mezzotints worked by or for Johann Andreas Pfeffel after paintings from supposedly Ridinger’s early years – here available in quite uniform even deep velvety qualities the 4-sheet set Roe-Boar-Bear-Quail of the C. F. G. R. Schwerdt Collection otherwise unbeknownst to all but Thienemann – are of similar size and Schwerdt III, 149 in addition records as what has to be described as practically a unique here not provable anymore since 1939 a St. Hubert after Johann Caspar Sing (Braunau/Inn 1651 – Munich 1729), with 33½ × 24⅜ in (85 × 61.8 cm) surpassing those once more. Showing “only” Ridinger’s “excudit” as publisher, it should be a genuine work of his nonetheless. However, with 29¾ × 36⅛ in (75.5 × 91.8 cm) sheet size here actually the most monumental sheet of the œuvre, albeit still engraved by third party, is the early Siege (and Conquest) of the Capital Halicarnassus (Th. 917) from the Alexander cycle. busting about any imagination of what even most fastidious collectors deem possible objectwise. Proposed to you besides with the recommendation of a timeless-elegant frameless hanging (fittings included) for that you will experience the respective light reflections to the fullest. – – – The Par Force Hunting of a Stag and how He is bagged. – Venatio Libera Et Violenta Cervi, Ejusque Occisio. Copper-printing-plate in reverse as before to Thienemann/Schwarz 67. Inscribed: Johann Elias Ridinger inven. fecit et excud. Aug. Vindel., otherwise in German-Latin text as above. 21½ × 29⅞ in (54.6 × 75.8 cm). as adequate to what made this inexpressibly fine sheet so unrivaled and unrepeated. – See the complete description.